From Oliver Reservoir, we are now into Nebraska on Route 80 and heading east. 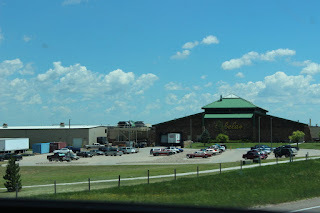 Not too far down the highway we pass Cabela's headquarters in Sidney. 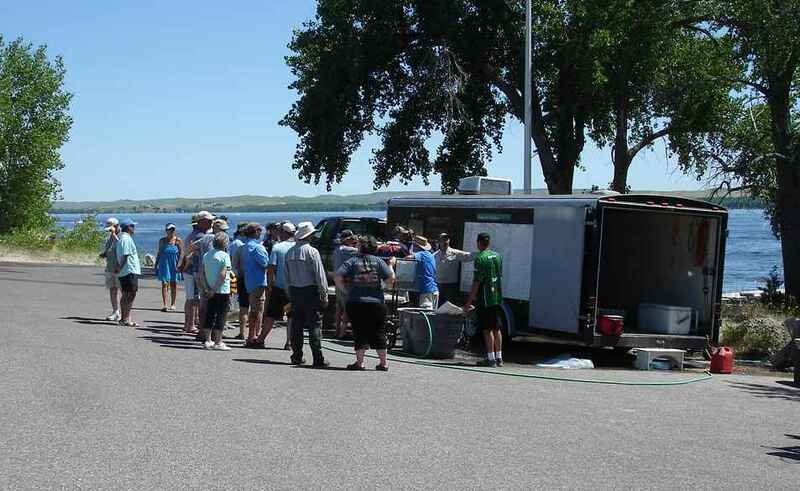 We heard a number of good things about the town of Sidney from campers in Nebraska. Southwestern Nebraska seems to be sparsely populated with many cattle ranches and few people. 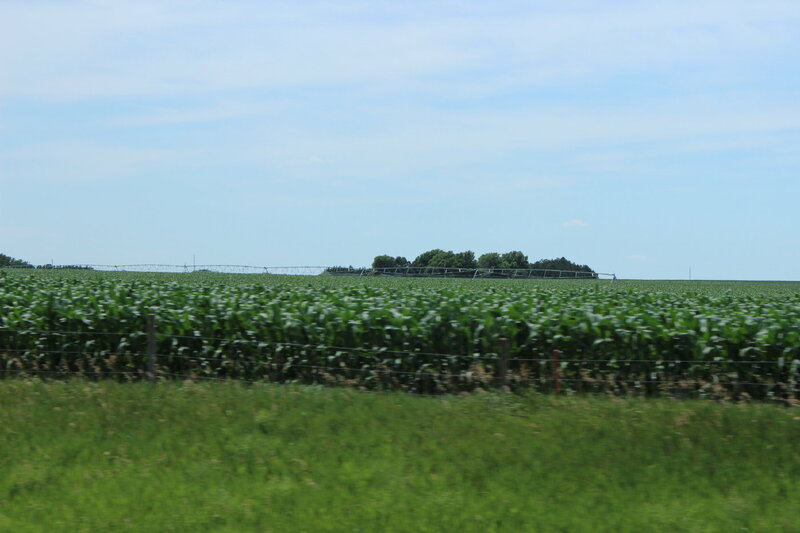 As we head east, there are more and more fields of corn and other grains. There are also more towns and people. 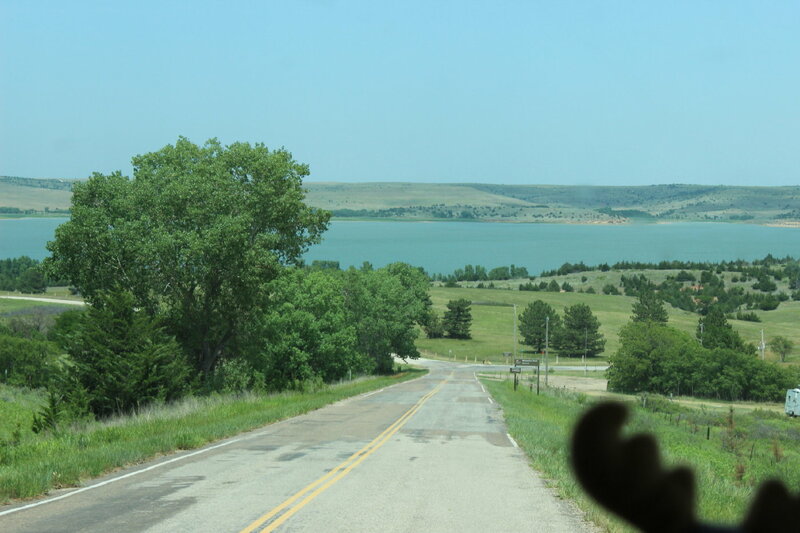 Our next stop is Lake McConaughy in Ogallala. 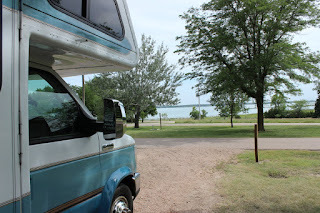 We arrive at the state park and quickly realize that this is a very different state park. The lake is 22 miles long. 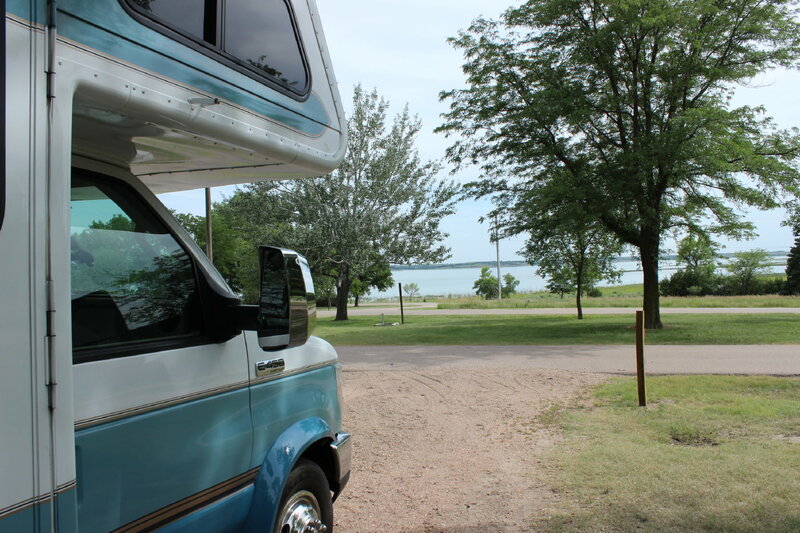 So, the four modern campgrounds are scattered along the northern shore of the lake. BUT, they allow primitive camping "just about anywhere" for $10 per night. The quotation marks are right from their brochure. 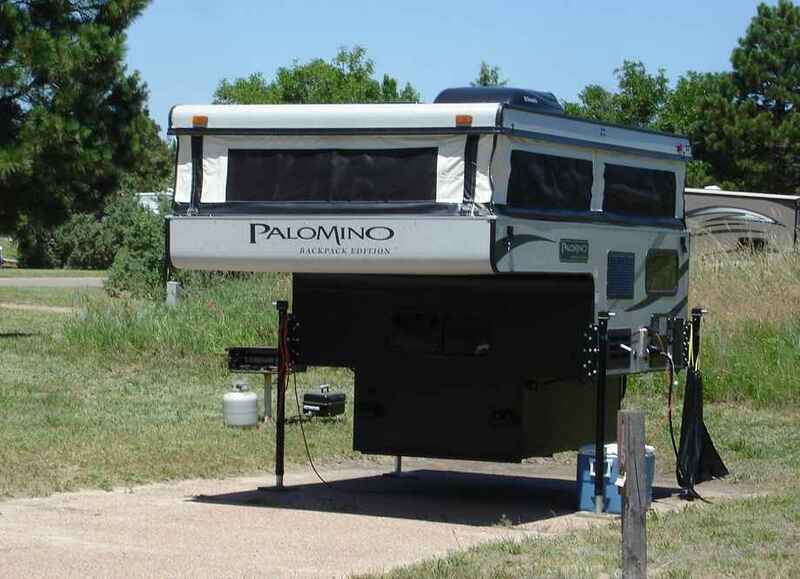 People will park at the beaches or on any flat surface with their RVs. Most also have boats along. 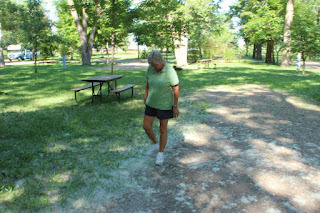 Jan and I head out walking to the boat ramp close by and discover that this weekend(before July 4th weekend) is host to a Walleye fishing tournament. 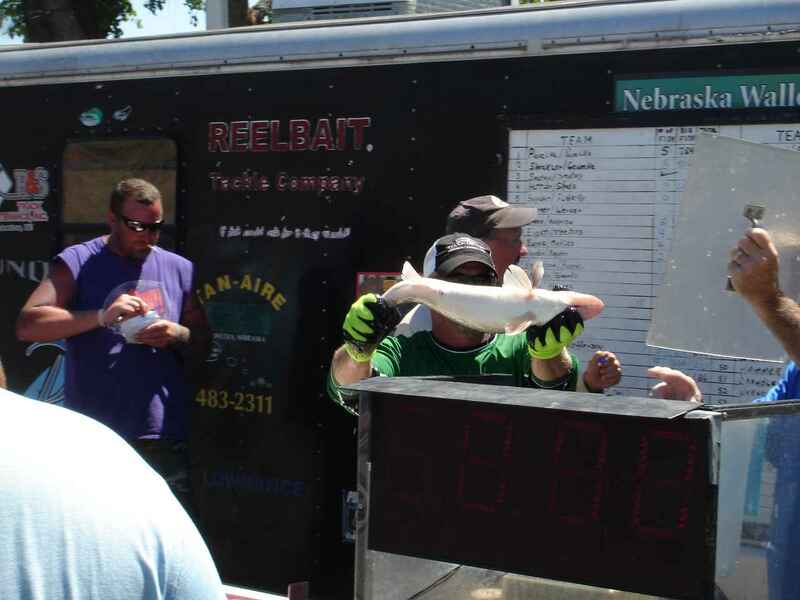 This trailer is the weigh-in for finalists. They catch 5 fish and record the total weight and the weight of the largest fish. 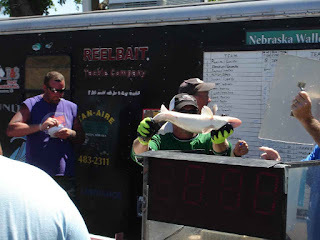 The competition was catch and release and they were doing pretty well with buckets of water and kids in the water to help the fish release. The top weights were in the 8 pound range. These links will give you some info on the tournaments. 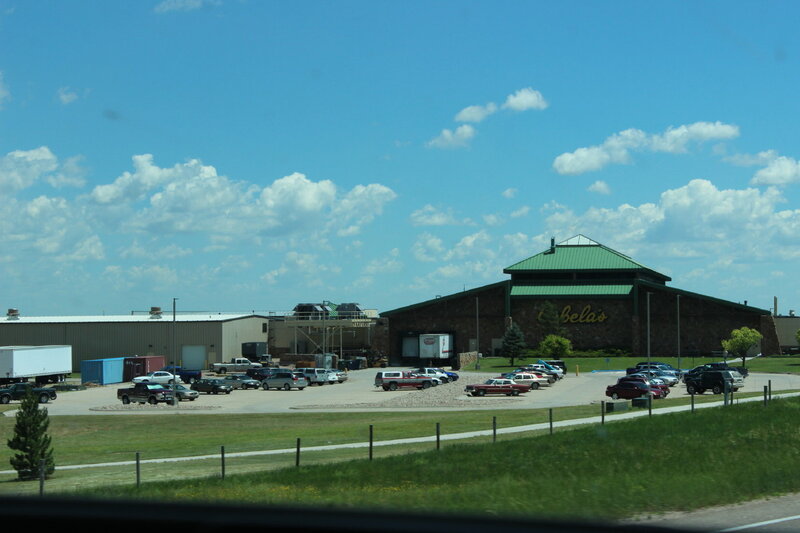 Colorado Walleye Association Nebraska Walleye Trail The sports stores seem to be all over the tournament, but Cabela's is a big sponsor. Many of the participants had team jerseys. Many fishermen were here from Colorado(not that far away). A couple of young gentlemen from Colorado indicated that they would be back on July 11 weekend with 150 other boats for the next tournament. 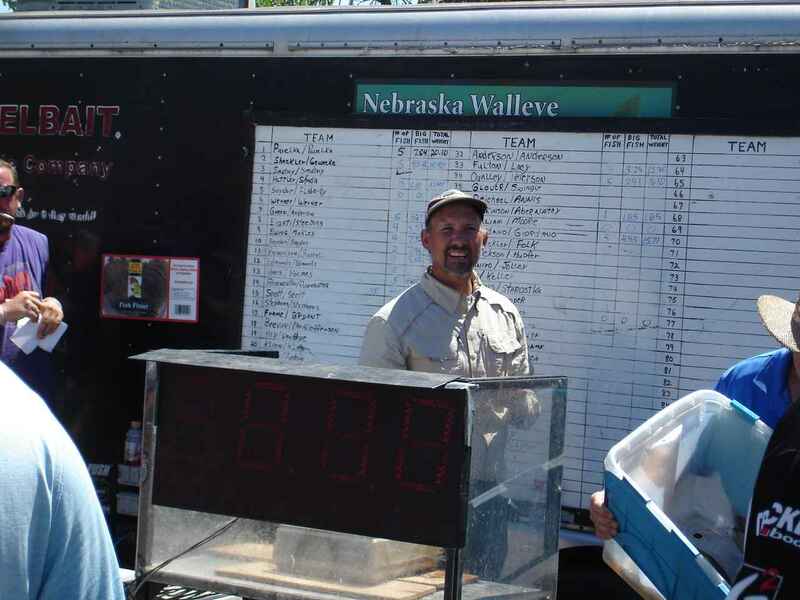 By the way, they also indicated Walleye were a great eating fish. A nice laundry stop in downtown Ogallala. That also was next door to Jan's Taco Restaurant. How could we not stop in? The Beef Burrito and a Chimichanga plate were delicious! 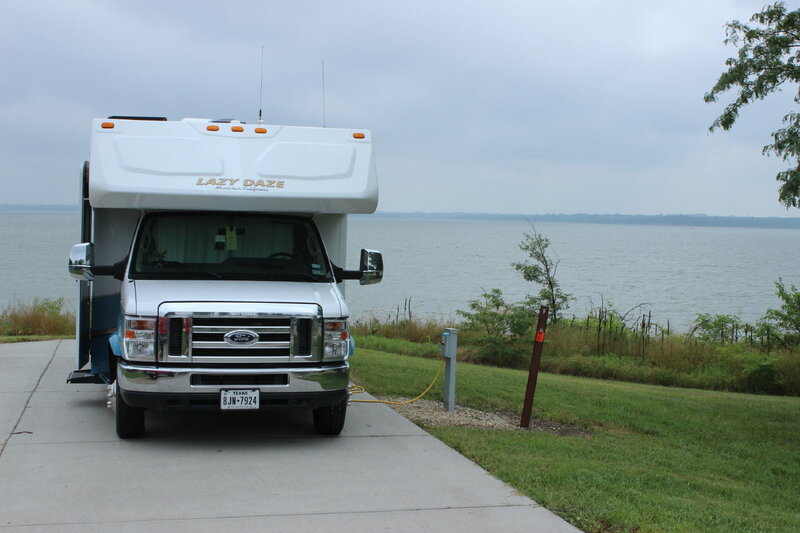 On to Lexington for a mail stop and Johnson Lake State Recreation Area in Elwood. 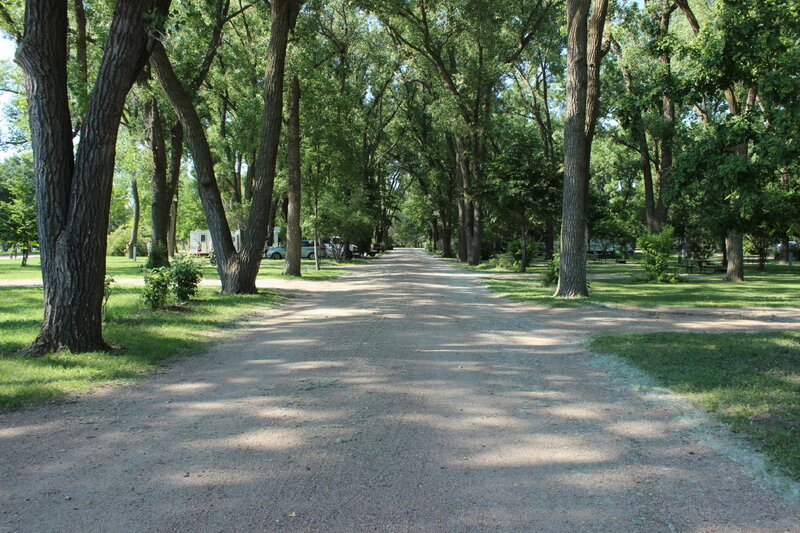 A beautiful park that is well groomed and treed. Manicured is a word that comes to mind. Jan is checking out the fallout from the Cottonwood trees. The corn is how high? 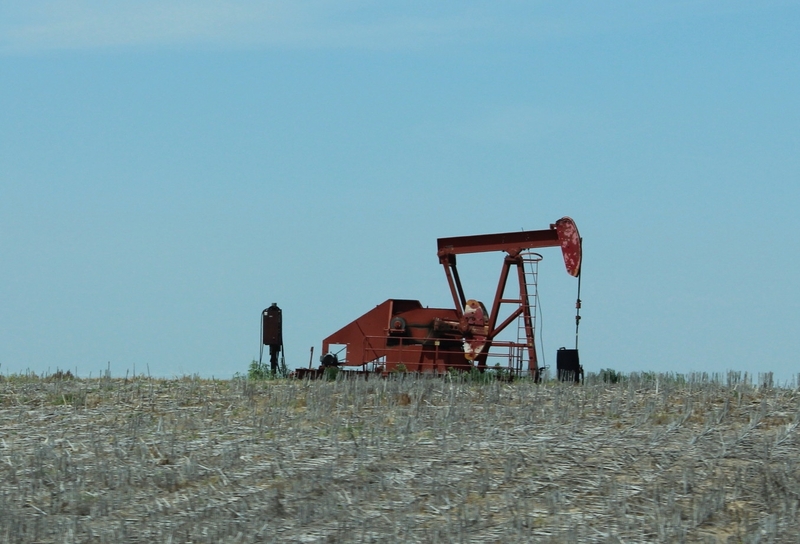 Actually, most of the fields we saw in Nebraska were close to shoulder high. But there were fields of younger corn as well. From Lexington we head down Route 283 and 136 to Hunter Cove Park COE in Alma. This is one of only two Corps areas in Nebraska. Was it hot? YES!!! 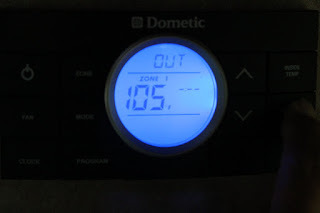 The 105 reading was on the roof, but a bank thermometer we passed was also reading 103! We learned that for the best cooling by AC, we needed to block off the cab section of the motorhome with a blanket hung from the bunk--like we also do in very cold weather. The reason? The cab section is from Ford and does not have insulated windows or much insulation otherwise(unlike the rest of Lady Blue). Makes a huge difference in heating and cooling. We're not in ------. Oh, wait a minute. Yes! We are in Kansas. Eustis was so excited! 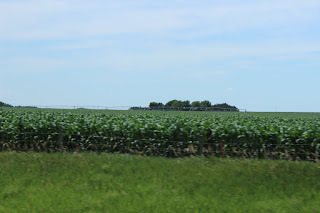 Along the Kansas roads we see many fields of corn and other crops. Also, some of the fields are much smaller and we are seeing many more farm houses and towns. Somewhat surprised to see so many oil rigs. From Harlan, we have come down Route 183 to Route 70 east. Our next stop is Minooka Corps of Engineer Park om Wilson Lake. Beautiful park with wonderful separation between sites. 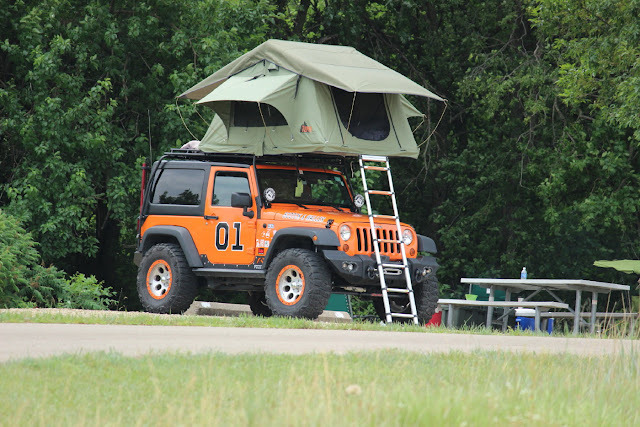 It is the day before the July 4th weekenders arrive and we are lucky to find one site with electric(for AC). We are noticing that Kansas is quite hot and humid. It is also quite stormy. Lots of warnings for severe storms. We also have seen posters for hail damage repair. A little unnerving. We are driving in and between rain storms. 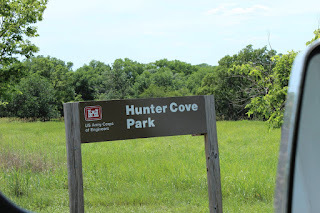 But we find a wonderful Curtis Creek COE Park on Milord Lake in Junction City. We are still on Route 70 and will be until the eastern side of Topeka. 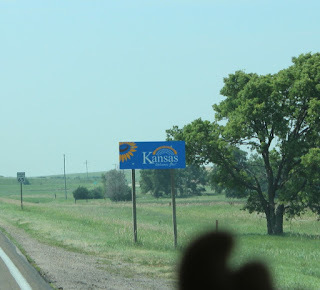 We like to stay away from interstates, but for Nebraska and Kansas we didn't see much better choices. 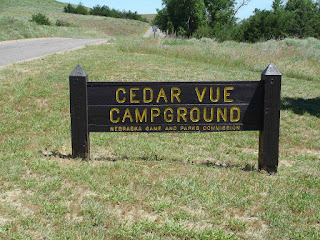 We could not stop on this leg of the trip because we needed to find a site for July 4th weekend( we rarely make reservations). Luckily there are 3 electric spots left on July 2nd through the weekend( still hot and humid). Still, it is surprising that there are a number of non electric spots left open for the weekend. We were tempted by a large motorcycle museum advertised in Salina. And I would love to stop at the Eisenhower museum in Abilene which is only a few miles west of here. We will see.